Forecast models keep an area of low pressure over the western Caribbean for at least the next week. A large cluster of storms is northeast of Honduras. The storms are more organzied this morning and there is potential for tropical development. I will begin updates if the storm is classified as a tropical depression. 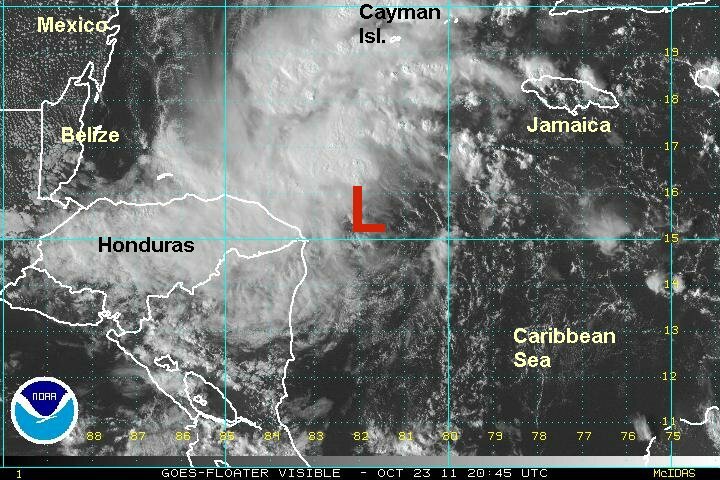 A low pressure area is apparent ene of the Honduras / Nicaragua border. Deep convection is building to the west of the low and it will likely be named a tropical storm later tonight or tomorrow morning. Several inches of rain is likely over northern Honduras and possibly into Belize and Mexico south of Cozumel over the next several days. Rainbands also are near the Cayman Islands. At 5 pm edt / ast the tropical disturbance was centered near 15.9 N / 81.9 W or 105 miles ene of the Honduras / Nicaragua border. Top sustained winds are estimated at 35 mph (NHC 35 mph last advisory). Movement: nw 12 mph. Pressure estimated at 1005 mb. Forecasts drift this tropical cyclone generally west over the next several days. Forecast solutions diverge after about three days so confidence in the track is not high. Although the forecast is for tropical storm strength, there is potential to reach a minimal hurricane. Rina has strengthened overnight and is edging farther offshore. At this time only The Cayman Islands and part of northern Honduras are seeing rain from Rina. Seas are up to about 9 feet and will continue to get larger. At 7 am edt / ast Rina was centered near 16.7 N / 82.4 W or 140 miles nne of the Honduras / Nicaragua border or 185 miles ssw of Grand Cayman. Top sustained winds are estimated at 45 mph (NHC 40 mph last advisory). Movement: nnw 6 mph. Pressure estimated at 1003 mb. Forecasts drift this tropical cyclone generally west over the next several days. Forecast solutions diverge after about three days so confidence in the track is not high. Although the forecast is for tropical storm strength, there is potential to reach a minimal hurricane. NHC now makes Rina a minimal hurricane at the end of the forecast period south of Cozumel also due to some of the models uncertainty. Rina has ungone rapid strengthening today. Conditions are favorable for further strengthening and Rina could become a major hurricane during the next 12-24 hours. Interests on the Mexican eastern Yucatan coast should make preparations for a hurricane. Cancun and Cozumel residents and visitors should follow the progress of Rina closely! At 4 pm edt / 3 pm cdt Rina was centered near 17.2 N / 83.1 W or 350 miles ese of Chetumal, Mexico. Top sustained winds are estimated at 80 mph (NHC 75 mph last advisory). Movement: nw 5 mph. Pressure estimated at 989 mb. Forecasts show Rina moving toward the coast of Mexico by Wednesday night / Thursday morning. A cold front will approach from the northwest which may turn Rina more to the east into the nw Caribbean by late Friday and Saturday. Rina has strengthened slightly overnight. An eye feature is still not visible which is somewhat unusual for a hurricane at this strength. At this time Grand Cayman is seeing thundershowers with light winds. The northeast Honduras coast has some rain also with light winds. A buoy to the east of Rina has measured seas up to 10 feet and NOAA has estimated that the highest waves are near 15 feet. 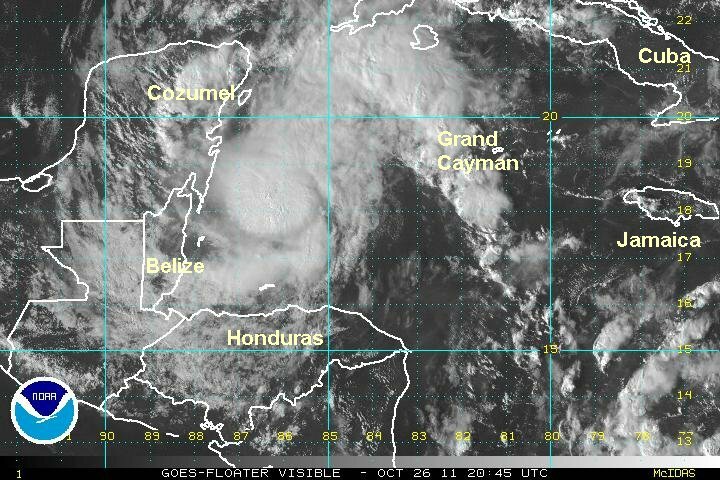 Interests on the Mexican eastern Yucatan coast / western Cuba should make preparations for a hurricane. Cancun and Cozumel residents and visitors should follow the progress of Rina closely! At 7 am edt / 6 am cdt Rina was centered near 17.3 N / 83.6 W or 315 miles ese of Chetumal, Mexico. Top sustained winds are estimated at 95 mph (NHC 100 mph last advisory). Movement: wnw 3 mph. Pressure estimated at 975 mb. Forecasts show Rina moving toward the coast of Mexico by Wednesday night / Thursday morning. A cold front will approach from the northwest which may turn Rina more to the east into the Yucatan Channel by late Friday and Saturday. With wind shear increasing by this weekend, Rina is expected to weaken as it approaches western Cuba. Rina is a little better organzied with an eye now becoming visible. Low clouds are still obscuring the eye. The latest recon shows just a touch of strengthening. Land areas are seeing only minimal effects at this time. NOAA forecasts indicate that the highest seas are in the range of 15-20 feet near the center of circulation. Interests on the Mexican eastern Yucatan coast / western Cuba should finish preparations for a hurricane. Cancun and Cozumel residents and visitors should follow the progress of Rina closely! Residents and visitors of the Florida Keys and sw Florida should also monitor the situation for any changes. At 5 pm edt / 4 pm cdt Rina was centered near 17.4 N / 84.3 W or 275 miles se of Cozumel, Mexico. Top sustained winds are estimated at 105 mph (NHC 110 mph last advisory). Movement: west 3 mph. Pressure estimated at 970 mb. Forecasts show Rina moving toward the coast of Mexico by tomorrow night. 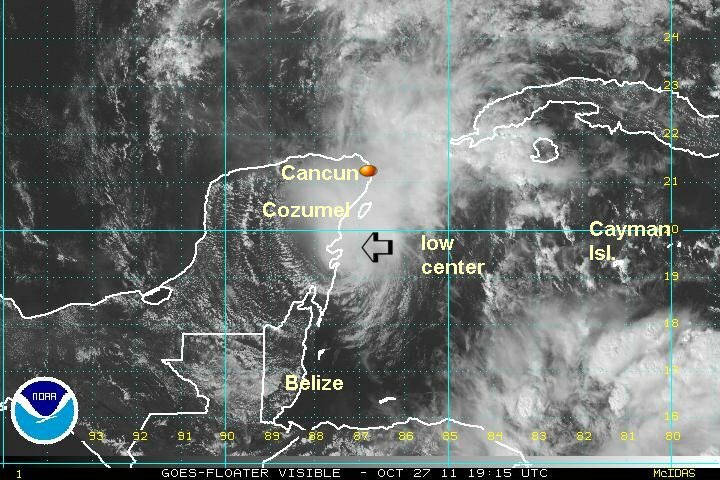 It should be near Cozumel by Thursday morning and Cancun later in the day. Upper air winds will turn Rina northeast, then east into the Yucatan Channel late Thursday into Friday. It should start to weaken early Saturday near western Cuba. One model moves it farther north toward the Keys but this is an outlier solution at this time. NHC has nudged the official track a little north because of this one forecast. Rina's intensity has not changed overnight. The hurricane center is predicting that Rina will become a major hurricane at 115 mph later today. Certainly from last night's recon it's apparent that winds aren't any higher and may be a touch lower. For now I'm keeping the winds the same until I can see for sure that additional strengthening / weakening is occuring. Once again this morning most of the effects of Rina remain offshore. Northern Honduras and the Bay Islands have rain. NOAA sea forecast show seas up to 20 feet near the center of circulation. 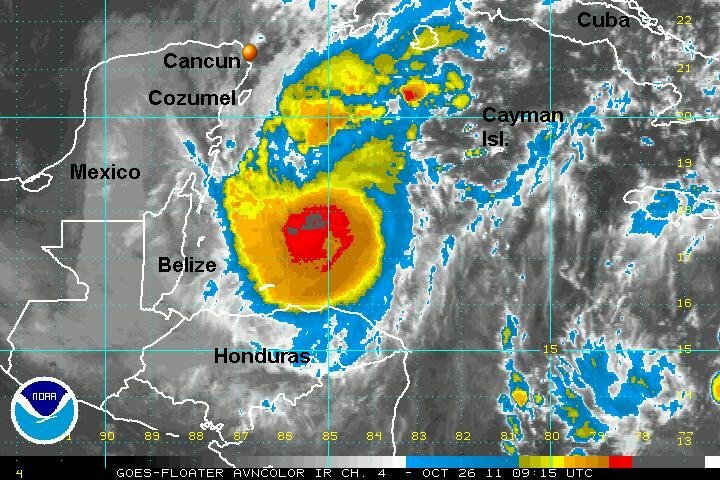 At 7 am edt / 6 am cdt Rina was centered near 17.5 N / 85.3 W or 225 miles se of Cozumel, Mexico. Top sustained winds are estimated at 105 mph (NHC 110 mph last advisory). Movement: west 5 mph. Pressure estimated at 967 mb. Forecasts show Rina moving toward the coast of Mexico by tonight. It should be near Cozumel by late Thursday morning and Cancun later in the day. Upper air winds will turn Rina northeast, then east north of the Yucatan Channel Thursday evening into Friday. It should start to weaken early Saturday north of or near western Cuba. Forecast models diverge in direction some by Friday night. In any case, Rina should weaken as upper air winds increase shear..
Good news for residents and visitors to Cancun and Cozumel. Rina has become more disorganized and is now only a minimal hurricane. NHC has now also dropped its prediction of becoming a major hurricane. I will make a complete update later this afternoon. Rina's has been disrupted today. The eye is not easily discernible but deep convection is just starting to expand again. This may signal a little strengthening as Rina approaches the Mexican eastern Yucatan peninsula. Cancun and Cozumel residents and visitors should follow the progress of Rina closely! Residents and visitors of the Florida Keys and sw Florida should also monitor the situation for any changes. 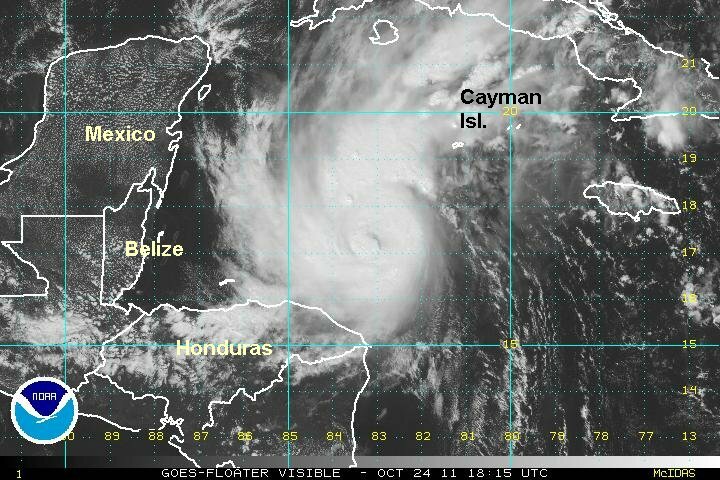 At 5 pm edt / 4 pm cdt Rina was centered near 18.2 N / 85.9 W or 170 miles sse of Cozumel, Mexico. Top sustained winds are estimated at 85 mph (NHC 85 mph last advisory). Movement: nw 6 mph. Pressure estimated at 979 mb. Forecasts show Rina moving toward Cozumel by late tomorrow morning and Cancun later in the day. Upper air winds will turn Rina northeast, then east north of the Yucatan Channel Thursday evening into Friday. It should start to weaken early Saturday north of or near western Cuba. Forecast models diverge in direction some by Friday night. In any case, Rina should weaken as upper air winds increase shear..
Rina's continues to weaken. IMO it is not a hurricane any longer and I fully expect NHC to downgrade soon. The appearance on satellite imagery combined with the recon report from a few hours ago that suggest a tropical storm strength system. It's possible that Cozumel and Cancun will not see winds stronger than 50 or 60 mph if this trend continues. Seas will also continue to subside today. This is great nows for the Mexican resorts of Cancun and Cozumel as well for tourists visiting this weekend. 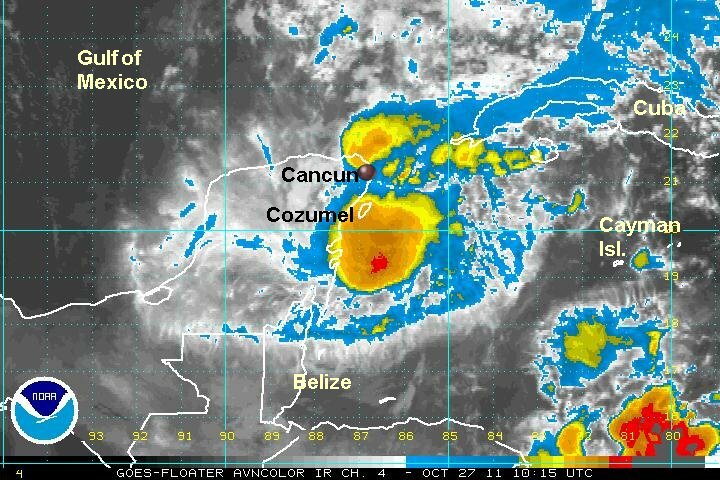 Only a few days ago, NHC had a major hurricane approaching Cozumel. In reality it is a strong tropical storm. What has happened with Rina is a testament of how hard it is to forecast a hurricane's wind strength. It is also a good example of why not to panic over long range forecasts. NHC did the right thing with their forecast since it was important to have the community prepared. It just shows the state of the art of of hurricane forecasting. Cancun and Cozumel residents and visitors should follow the progress of Rina today. Residents and visitors of the Florida Keys and sw Florida should also monitor the situation for any changes. 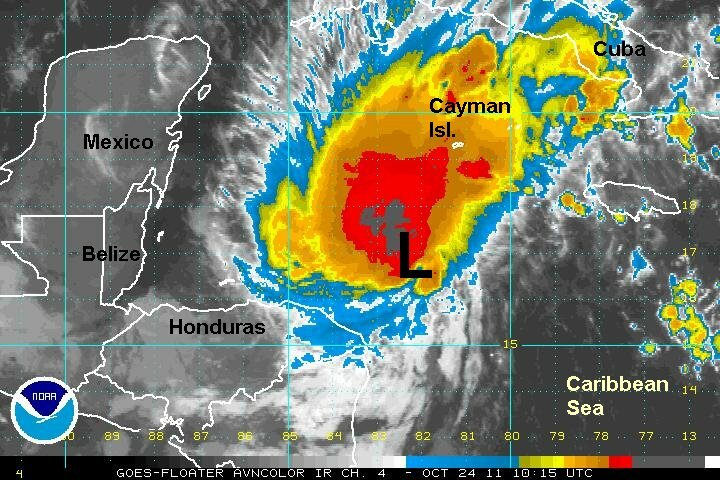 At 7 am edt / 6 am cdt Rina was centered near 18.8 N / 86.9 W or 115 miles south of Cozumel, Mexico. Top sustained winds are estimated at 65 mph (NHC 75 mph last advisory). Movement: nw 6 mph. Pressure estimated at 988 mb. Forecasts weaken Rina as it interacts with the Yucatan peninsula today. It will continue to weaken as upper level winds turn it northeast, then east near the Yucatan channel to western Cuba Friday and Saturday. Rina's circulation continues to fall apart. It is a very small system south of Cozumel The last recon recorded surface winds to 37 knots. That's a little over 40 mph. 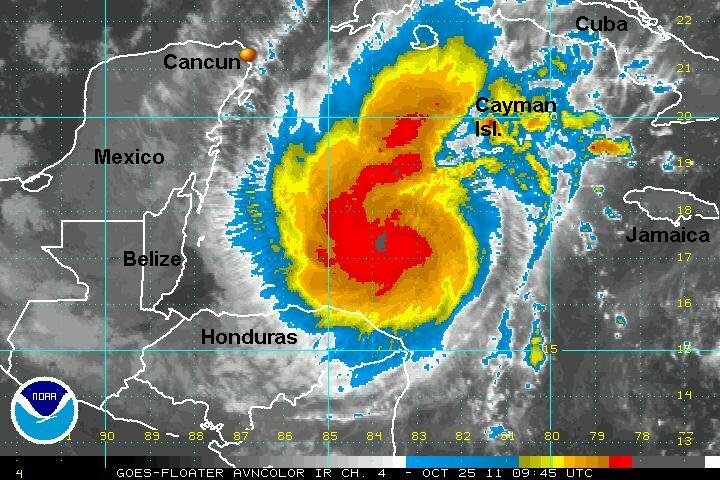 It is unlikely that Cancun or Cozumel will sustain significant damage. With Rina interacting with land the circulation will likely continue to weaken. At 4 pm edt / 3 pm cdt Rina was centered about 50 miles ssw of Cozumel, Mexico. Top sustained winds are estimated at 50 mph (NHC 70 mph last advisory). Movement: nnw 6 mph. Pressure estimated at 995 mb. Forecasts weaken Rina as it interacts with the Yucatan peninsula tonight. It will continue to weaken near the Yucatan channel over the next day or two. Upper air winds continue to tear at the circulation of Rina. It is still a little tough to tell exactly where Rina is positioned. The deep convection with the heavy showers and storms are heading to the west coast of Florida. If the circulation is close to Cancun per the 5 am NHC advisory it is probably not even a storm. Visible satellite imagery over the next seveal hours will reveal much more about the structure. 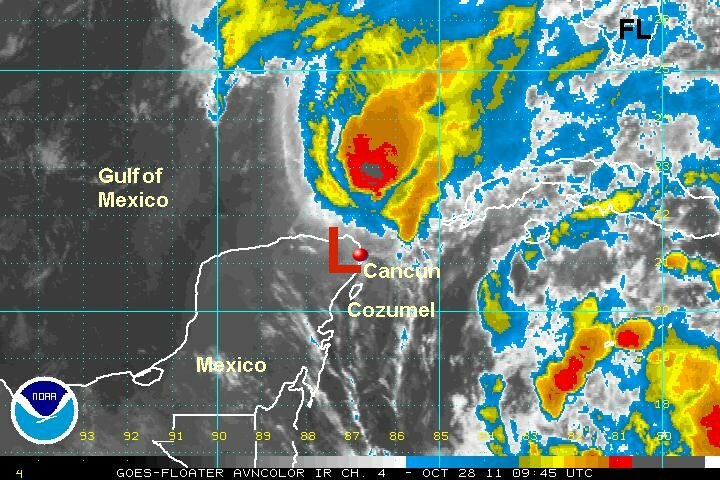 At 7 am edt / 6 am cdt Rina was centered near 21.2 N / 87.0 W or just nw of Cancun, Mexico. Top sustained winds are estimated at 40 mph (NHC 50 mph last advisory). Movement: nne 5 mph. Pressure estimated at 998 mb. Forecasts weaken Rina and move it south back into the northwestern Caribbean. This needs to be watched carefully as any tropical system over water can regenerate. I would also like to see the visible satellite pictures to confirm that the low center actually isn't continuing north into the southeastern Gulf. 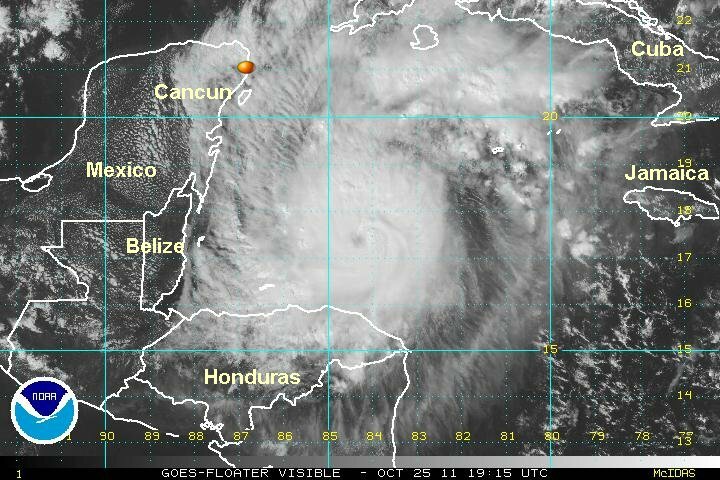 The first visible satellite images suggest that Rina is no longer a storm. The heavy thunderstorm cluster heading toward Florida is associated most likely with a mid level circulation.